At graduation time, nothing is more rewarding for students than being recognized for any and all special achievements and services they have performed throughout their educational experiences. The American Red Cross Red Cord Honors Program provides qualifying students with a red graduation cord which they can don with pride at their high school commencement services. 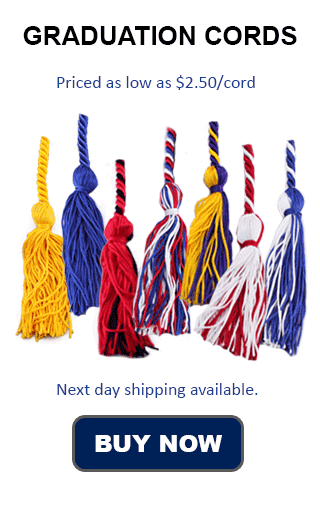 Our red honor cords may be used to recognize such service-minded students when graduation time rolls around. The biggest distinction between Red Cross red honor cords, and Red Graduation Cords from Honors Graduation is the immidiate availibility of our cords. They can be easily ordered any time day or night from our website. Once ordered our red cords ship out fast and will get to you within 4-6 days or faster if you choose a faster shipping method. To qualify for the Red Cross honor cord, students must have either donated blood, or participated as volunteers in a school or community blood drive, at least three times during the course of their senior year. By giving so much of themselves to serve others, your students prove that they are focused on improving the world around them, and with red graduation cords, you are recognizing them for their willingness to help the community, and encouraging them to continue in the path of service and helpfulness for the rest of their lives. The Red Cord Honors Program represents more than just a students donation to give life; it also symbolizes their giving nature, and the potential they have to change the world for the better. Our red graduation cords will stand out against a graduation robe in almost any color, marking your student out as one of the special few who is willing to give the gift of life to those in need. Offer our red honor cords to students who qualify for the Red Cord Honors Program, and see the light in their eyes as they enjoy the honor of being so singled out at their commencement exercises. The special feeling of being recognized for a good deed is unparalleled, and can offer your students the boost they need to feel confident as they begin their college careers, or go out into the professional world.